Combining a historian's rigor with a foodie's palate, Ten Restaurants That Changed America reveals how the history of our restaurants reflects nothing less than the history of America itself. Whether charting the rise of our love affair with Chinese food through San Francisco's fabled the Mandarin, evoking the richness of Italian food through Mamma Leone's, or chronicling the rise and fall of French haute cuisine through Henri Soulé's Le Pavillon, food historian Paul Freedman uses each restaurant to tell a wider story of race and class, immigration and assimilation. Freedman also treats us to a scintillating history of the then-revolutionary Schrafft's, a chain of convivial lunch spots that catered to women, and that bygone favorite, Howard Johnson's, which pioneered on-the-road dining, only to be swept aside by McDonald's. 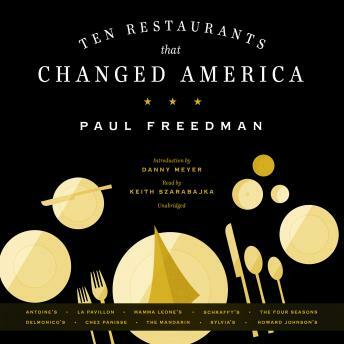 Ten Restaurants That Changed America is a significant and highly entertaining social history.